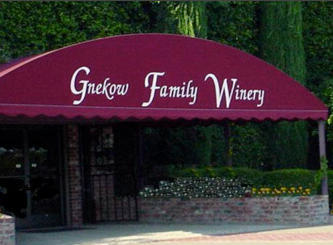 Gnekow Family Winery (pronounced “nee-ko”) was founded upon two essential principles; first – handcraft quality wines that represent exceptional values by applying Old and New World winemaking techniques to the grapes from our distinctive region and second – create wines that would be fun and exciting! Our state-of-the-art winery is located in Collegeville, California about an hour from the Napa Valley, in the rolling hills between San Francisco and Yosemite, not far from Mondavi-Woodbridge. Our Signature Wine, the Campus Oaks “Old Vine” Zinfandel, is selectively chosen from our 80+ year old vineyards and has consistently won Gold Medals every year since it’s initial harvest in 1997. In 2004, we introduced our Honor Series, which features the graduation of our quality Old Vine Zinfandels to higher award winning levels. At Gnekow Family Winery, we are proud of the wines we produce, the region we represent and the people who help us create “Great Wines at Great Prices”. Our commitment is to produce quality, value-oriented, easy-to-drink and interesting wines while maintaining our friendly professional approach to doing business.